6-The first candy cane dates back to 1670 in Germany. A choir director distributed the sugar sticks to young singers during a Christmas services to keep them quite. 7- More then 1.7 billion candy canes are made every year. 8- Charles Dickens write 'A Christmas Carol' between Oct and November of 1843. The story was a hit, selling 6,000 copies by Christmas Day. 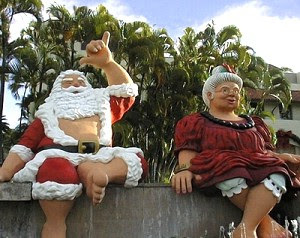 9- Mele Kalikimaka (Hawaiian for Merry Christmas) is actually phonetic. When Westerners brought the tradition to Hawaii the locals were having trouble pronouncing Merry Christmas so turned it into words more easy to roll off their tongue. 10- Santa arrives to Hawaii in a bright red outrigger canoe, it carries him across the sea right onto the beach. Sleighs aren't much use so the reindeer can take a little rest while deliveries are made on the islands!